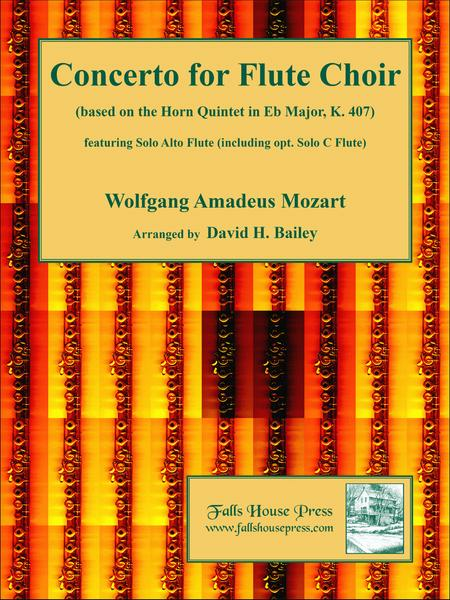 Mozart's Concerto for Flute Choir, arranged by David H. Bailey, is based on the Horn Quintet in Eb Major, K. 407, featuring Solo Alto Flute, including an optional Solo C Flute part. Mozart is one composer whose music is always a pleasure for flute choirs to work on, and this work provides a great opportunity for a soloist who might otherwise not feel comfortable being a soloist. Originally written as a horn quintet, written for horn and string quartet, Mozart used a different instrumentation than the standard string quartet, favoring lower instruments. It was scored for one violin, two violas and bass instead of the more traditional two violins, one viola and cello. The horn part, while standing out as the solo line, was much less virtuosic than many solo lines and thus lends itself to people who might feel shy about playing a showpiece such as Fantasie Hongroise or one of Mozart's flute concerti. This arrangement includes a solo part for C instrument, which will sound fine on any of the C flutes: piccolo, C flute, bass flute or contrabass flute and also includes a solo part for alto flute. The ensemble parts are for C flute, two alto flutes and bass flute (doubling with contrabass flute makes the whole arrangement sound even richer), but there is an alternate C flute part to substitute for the first alto flute part, to make the ensemble parts more versatile for groups who decide to have the solo played on alto flute. And, Mozart being Mozart, audiences will love this addition to the flute choir literature.